If you are in search of a filling, tasteful, and versatile salad then fear no more because you have just found a winner! This black bean and veggie salad is full of delicious ingredients and can be used for any meal, appetizer, or snack. Superbowl party coming up? This salad is a MUST. Try for yourself! Prepare this salad the night before by draining the beans, peas, corn and pimento pepper into a large mixing bowl. Next, mix in all the veggies. Meanwhile, in a saucepan bring salt, pepper, water, vinegar, vegetable oil and sugar to a boil. Let cool and then pour over bean mix. Place in the fridge to marinate overnight. In the morning, cook an egg over medium heat in a frying pan. 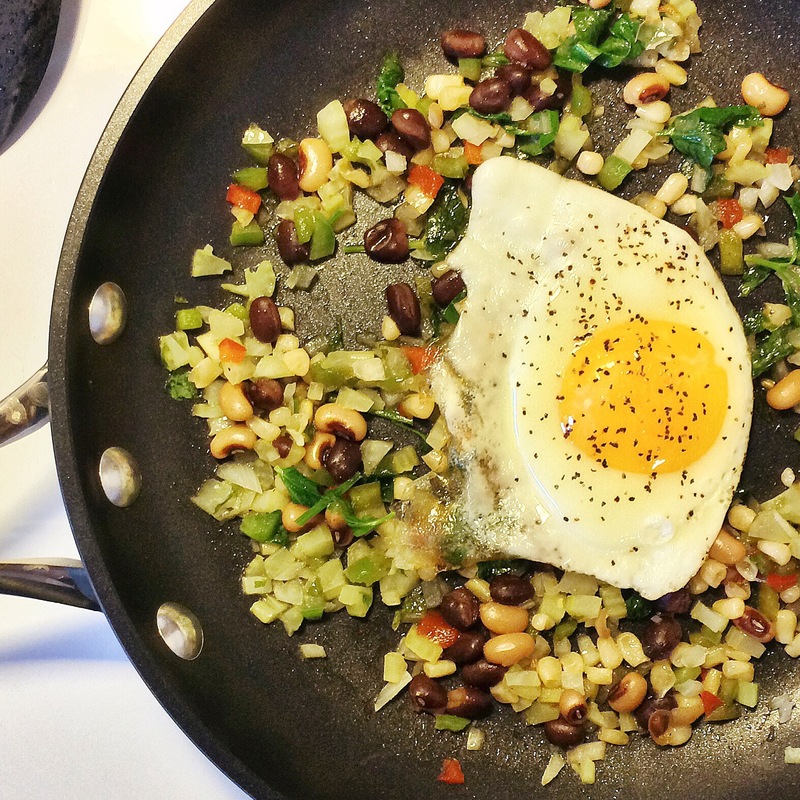 In another frying pan, cook desired amount of black bean and veggie salad for 5-6 minutes or until warmed. Spoon salad into a dish, top with your egg, and enjoy a scrumptious breakfast! This salad is also perfect in a green leaf salad or as a salsa with chips. Bon appétit! Previous Post Get oat-ta town…did you say Coffee-infused oats?! Next Post Go-Ji or Go Home!